It's been a long road for Sakura. After capturing all the magical Clow Cards, she has had to deal with magical miscellany of all sorts, including converting the cards into a new Sakura form and meeting the reincarnation of Clow Reed, Eriol. The Sealed Card, the second Cardcaptor Sakura movie, pits the magical girl against one more challenge: the last, most powerful Clow Card. Indeed, if you're new to the Cardcaptor Sakura series, The Sealed Card is not the place to start. The events that take place in the movie are all tied to the show's second season, which Pioneer has just released in the U.S. on DVD. Even a basic synopsis up to the point of the film would leave out many important plot points. So much has gone on in the series over the course of two seasons, and the film seems to take pride in that fact. This film is for the die-hard Sakura fan. Basically, Li and Meilin have come back from Hong Kong to visit Tomoeda during the town's festival. Meilin (along with co-conspirator Tomoyo) has the ulterior motive of setting up Sakura and Li. However, magical occurrences involving disappearing objects have occurred all over town. Usually, such events could be blamed on the Clow Cards - but Sakura captured all 52 - or Eriol, who has left for England. The answer lies beneath Clow Reed's old home, with one last card, the Sealed Card, whose negative power matches the positive power of all 52 of the other cards. To stop the wanton destruction of Tomoeda, Sakura has to seal the last card away, but to do so, she must give up her strongest feelings. Obviously, the cards take a back seat to the melodramatic tension between Sakura and Li. Unlike the first movie and much of the TV series (which had become a "Card of the Week" program) Movie 2 definitely moves the plot along. The action is pretty good at times, especially at the film's climax. The entire production moves along at a brisk pace, aside from a school play Sakura and Co. put on, which drags on like a real school play. 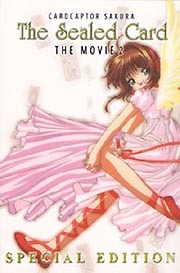 Much like the series itself, the action is combined with melodrama, which reaches its fever pitch during the film through the resolution of one of the series' biggest conceits, the relationship between Sakura and Li, and through comedy (usually initiated by either Sakura's brother, Toya or Kero). Unlike the TV series, the movie eschews the shock value of having a new bad guy (or card) every week, a trap many long running anime fall into. Visually, the film looks great. This is what CLAMP is all about, which is a fact that one can forget looking at the stiffer, less vibrant TV series. The colors jump out, everything moves, and the backgrounds are excellent. Add to that the gorgeous character design CLAMP is known for and the whole effect is very good. The character design is dead-on and visually everything is a treat. The audio is good stuff too; the film features two or three of the series' best vocal songs. Pioneer's DVD "Special Edition" is also pretty good. The DVD starts up with an attractive and adorable pre-menu load screen featuring the main characters. The menus themselves are cute, featuring Sakura and the flowers she gets her name from. The packaging is eye catching and in the vein of the series itself. For a "Special Edition" DVD (and yes, there is a not so special edition) there aren't enough extras on the disc. There are a few freebies with this edition however; there is a limited edition pencil board (I'm not a ten year old school girl, nor do I use pencils that much, so it wasn't a major draw for me) and a Tomoyo photo book, basically an insert with laminated "photos" of Sakura. Overall, fans of the series know who they are. If you've been keeping up with Sakura, then you most likely already have this movie. If you're not a fan, the movie still might be something to see, as it does away with the weekly tedium of a new card running amok every week. However, if you're not up to speed as to the goings on in season 2 of Cardcator Sakura, you'll definitely need a refresher.